Home/Lifestyle/Variation in Heights across the world – Which heights are considered attractive? Height is perhaps the most debated phenotype over the years. Influenced by a number of environmental factors and genes, average height can vary as much as 30 cm across the globe. According to researchers, 20% of the variation in human height across the world is due to almost 700 genetic variants found. For this study, about 400 regions were selected to that the data can be deemed as fairly accurate. The height phenotype is 80% affected by the inherited genetic code while 20% relates to the exposure to different environmental influences which include but are not limited to access to minerals, a balanced diet, upbringing, activity level etc. In the past height has been linked with the standard of living. Heights were deemed to be the indicator of the economic well-being of a country. While it may portray the economic well-being, height is not considered to be as a measure of happiness and has a series of varied patterns. Data till date has evolved over the years and data as old as 1890s was available for proper analysis. The 19th and the 20th century has seen the world average human height increasing at a very slow pace and it can be safely said that the average oscillates around 170 centimeters. Statistical data obtained have shown that the height of people related to the agricultural sector showed high variations. This means that the phenotype has a strong correlation with the lifestyle and the foods that are consumed. Another notable factor that is known to affect human height is the climate prevalent in the region. Two independent studies focused on individuals from Japan and Mexico concluded that the place, environment, climate and standard of living is responsible for controlling height and other physical characteristics as well. As the standard of living and the height attained have been linked numerous times in the past a statistical analysis has found out that the height of an individual is closely related to the income. In fact, there is a very strong correlation between income and height and the correlation is positive. One of the most intriguing things about this positive correlation is the question, why are the African born people taller than the rest of the world. It is a known fact that Africa does not have a high standard of living for most individuals and yet they are so tall. According to researchers the correlation indeed becomes negative when Africa is added to the equation and researchers argue that the differences in height are mostly attributable to dietary differences and child mortality rates. The way people adapt to poverty across the globe also plays a vital role in determining the height. There is ample evidence to suggest that taller people on average have higher education, earnings, and a better social standing. Statistical data has shown that the variation in height has a non-uniform pace to it. Some countries including Japan and Korea have witnessed an increase in the average height over the last 50 years. But it is notable that the increase was almost nonexistent for the Japanese after the 1980s but the average height of Koreans kept on increasing into the 2000s. Other South Asian countries including India and Bangladesh are also witnessing a plateau and the changes in heights are almost negligible. European countries, particularly Spain, continue to see an increase in the average height whereas the pace of increase has slowed down considerably for the US too. 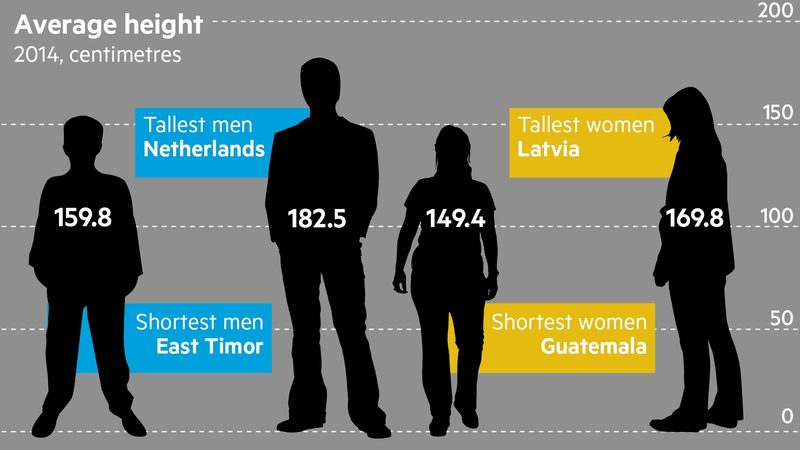 The differences in heights across the globe are striking, from 161.6 cm in Timor-Leste up to 183.8 cm in the Netherlands (22.2 cm). Tall statutes are common in the US and Europe probably owing to the high per capita income and high-quality healthcare services. The middle eastern countries and China are positioned in the middle with heights averaging around 170 cm. Upon careful review of the obtained data and the many variables involved it can be safely concluded that the consumption of milk is the first and foremost component that determines height. It is closely followed by red meat and eggs. These foods have been tested and are confirmed to include a full range of amino acids that help the body reach its full potential. 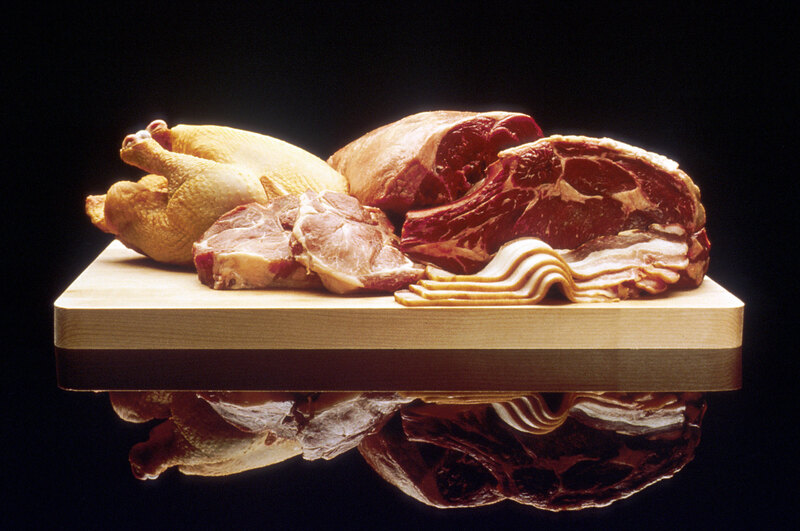 Surprisingly, beef and fish carry a high amino acid diversity and count while pork scores quite low. But due to lack of enough scientific data to back the findings a correlation cannot be established between the mentioned foods. High rice consumption symbolizes a diet with a low content of milk and other important foodstuffs and reflects general malnutrition. This malnutrition can cause stunted growth. In tropical Asia, there is a high consumption of rice and low consumption of protein and energy. It is accompanied by small statures between 162 and 168 cm. Muslim countries of North Africa and the Middle East consume high quantities of wheat and plant-derived proteins but the average height among males is still short and does not exceed 174 cm. Europe and the US consume high quantities of animal proteins particularly derived from dairy. This region is characterized by the tallest statures in the world (>180 cm). Differences in the type of protein being consumed observed a difference of 10 cm (174 cm vs. 184 cm). The human development index (HDI) is the only factor that shows a strong positive correlation between male height and nutrition. Children’s mortality is the strongest correlate of stature among all the remaining socioeconomic indicators, but the forward stepwise regression also highlights the role of a lower total fertility and partly urbanization as additional factors that can be targeted, when trying to speed up the pace of the positive height trend. The final height of the individual is dictated by genetic factors. The socioeconomic and nutritional data obtained from across the globe may not be a representative of the whole population. The data is obtained through people like soldiers, criminals, slaves, and servants, so it may not be a clear representation of the population as a whole. The stature of a person is not just a phenotype but also gives the individual a better social status. In some cultures, men of good height are revered. But what exactly is considered a good height? Across the globe, people from different regions show affection for different heights. In Europe the preferred heights were recorded as 5ft 8 inches or 172 cm and 165 cm for men and women respectively. As for the U.S, most people showed affection for 188 cm and 168 cm for men and women. In Africa, the preferred height among men is 190 cm while women having a height of 170 cm were found attractive. Asian women were the least demanding and showed that they found men with heights around 172 cm as attractive. Asian men had a preference for women who were around 162 cm in height. According to a study, Being taller not only enables a person to be more confident it has been linked with better education, social status, living standards and even longer lasting relationships. Generally, taller people are considered more successful.